110 FIT will motivate you, get you moving, and get you fit -- on your own turf. Whether you have a dedicated fitness center, auditorium, cafeteria, or large meeting room, we'll accommodate the environment to get your group fit. 110 FIT, based in Leesburg, VA, offers mobile and studio based fitness services to corporations, schools, churches, and neighborhoods in Loudoun County. 110 FIT is dedicated to giving individuals the tools needed to achieve fitness today and improved health for life. Help get your group fit with a fresh and fun 110 FIT flare where we place special emphasis on aligning our delivery with the culture, needs, and fitness ability of our clients. 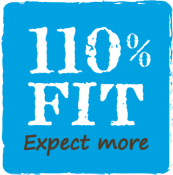 110 FIT will meet you at your starting block and deliver classes that works for all fitness levels at your location. Commitment: One-time, Short-Term or Long-Term agreements available.